The Journal of Science was established in 1985 for the publication of national and international research papers in all fields of natural sciences and technology, social sciences and humanities. Since then, the journal has grown in quality, size and scope and now comprises a dozen of serials spanning academic research. 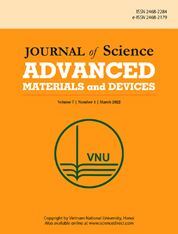 With the rapid expansion of the field of materials science, the Journal of Science is now delighted to announce the launch of the Journal of Science: Advanced Materials and Devices. This new serial publication will provide researchers with the opportunity to publish research covering all areas of materials science and technology in the popular Journal of Science series. As a fully open access publication, the journal will provide maximum exposure for published articles, making the research available to all to read and share. Published by the Vietnam National University, Hanoi, the journal will be produced by Elsevier, home of Materials Today, and hosted on ScienceDirect. A corresponding English print version is also available.